Future business activity in U.S. hotels rose in April according to the latest reading of the Hotel Industry Leading (HIL) Indicator. eâˆ’forecasting.com's HIL increased by 0.4% in April to 138.8, following an increase of 0.3% in March. The index is set to equal 100 in 2010. Future business activity in U.S. hotels rose in April according to the latest reading of the Hotel Industry Leading (HIL) Indicator. 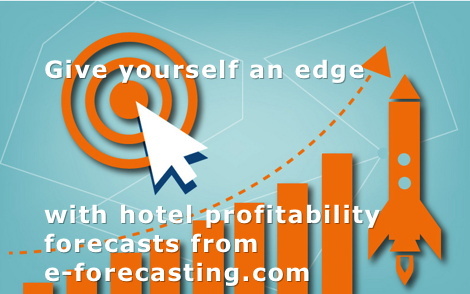 e−forecasting.com's HIL, a composite of nine predictive analytics which gauges future monthly overall business conditions for U.S. hoteliers, increased by 0.4% in April to 138.8, following an increase of 0.3% in March. The index is set to equal 100 in 2010. "The probability of the hotel industry entering into recession in the near-term, which is detected in real-time from HIL with the help of sophisticated statistical techniques, registered 1.2% in April, down from 1.3% in March," said Maria Sogard, CEO at e­forecasting.com. "As a result, the probability that the U.S. Hotel Industry will be in the expansion phase of its business cycle in the near-term marked 98.8% in April, higher than March's reading of 98.7%." Maria added. "Five of the forward looking predictive analytics of business activity that comprise Hotel Industry Leading (HIL) Indicator had a positive contribution to its change in April: Jobs Market; Hotel Profitability; Foreign Demand; New Orders; Vacation Barometer; Four indicators of future business activity had a negative or zero contribution to HIL's change in April: Hotel Worker Hours; Yield Curve; Oil Prices; Housing Activity; " said Evangelos Simos, professor at the University of New Hampshire and series editor for predictive analytics databases at e-forecasting.com.